Liposuction is a treatment where overweight patients can shed fat by a process where fat cells are removed from the body. In recent years, various new liposuction techniques that have arisen that have enhanced patient comfort and recovery period. Today, most liposuction patients return home on the same day of the procedure with minimal discomfort. A liposuction procedure can be done either surgically under general anesthesia or with a minimally invasive technique under local anesthetic with intravenous sedation where the patient is only sedated. General anesthesia cases where the patient is put to sleep as an inpatient in a surgery center or hospital typically last 2 hours or so, and the patient can spend another few hours recovering before being discharged. General anesthesia cases are generally used for larger cases where there are multiple areas to be treated and may include fat transfer back into some areas for body shaping. Local anesthesia cases using laser or radiofrequency assisted liposuction typically last an hour and a half or so but the patient can be discharged immediately after. Local anesthesia liposuction is generally used where the fat is in two or three specific areas and not in multiple locations. During a consultation a plastic surgeon will be able to judge by the amount of fat to be removed and from what areas, which is the best option for the patient. Liposuction is a surgical procedure that modifies the body’s contour by eliminating excess fat deposits located between the skin and muscle. What Realistic Expectations should I have of My Liposuction Surgery? After any liposuction procedure, the new body’s contour is more or less permanent. If a patient does manage to gain a reasonable amount of weight after liposuction treatment, then a revision may be necessary however. Most often, patients are asked to wait 6 months before the surgery results are considered final result. The most commonly treated areas for women are the abdomen, back, hips, buttocks and thighs. In men, the most frequently treated areas include the flanks (“love-handles”), and breasts. Many patients also undergo liposuction for cheeks and chin. Liposuction treatment is incredibly safe with very few substantial side effects. As judged by current international experience, liposuction is proven incredibly safe. Occasionally if post operative instructions are not followed, problems that can possibly happen following treatment include; infections and skin ulcerations. Liposuction treatment is performed by plastic surgeons who have attained special training in the methods of liposuction. At Montreal International Clinics, our cosmetic surgeons are internationally certified and with many years of experience of having treated individuals with cosmetic procedures. Like any minor surgery, there may be some minor discomfort post liposuction surgery. During the first 48 hours, patients may expect a slight discomfort based on the type of anaesthesia used during the procedure. Soreness and tenderness is expect to decrease steadily soon after. The local anaesthetics will be administered prior to surgery and pain medication may be prescribed after to keep you relaxed and pain free. Once your observation period is complete, you will be able to leave the facility and return home. Most patients return to work within one or two days after tumescent local anesthesia liposuction. Because of the substantial decrease in swelling, tenderness and pain after liposuction, patients are able to return to normal physical activities very soon after the procedure. A tummy tuck also known as abdominoplasty, is a surgical technique under general anaesthesia, and involves liposuction and removal of fat, plus excision of skin. 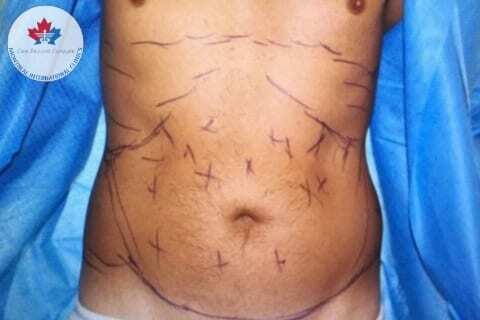 Tummy tucks are used in conjunction with liposuction in patients with a large amount of fat to be removed. This is because very large amounts of fat removal, will leave behind too much excess skin to elastically return to normal and skin excision is required.